Therapy Center strives to provide superior rehabilitation services for patients within the communities we serve. Because of the current imposed Therapy Cap, our patients are limited to the amount of outpatient therapy they can receive under Medicare Part B. 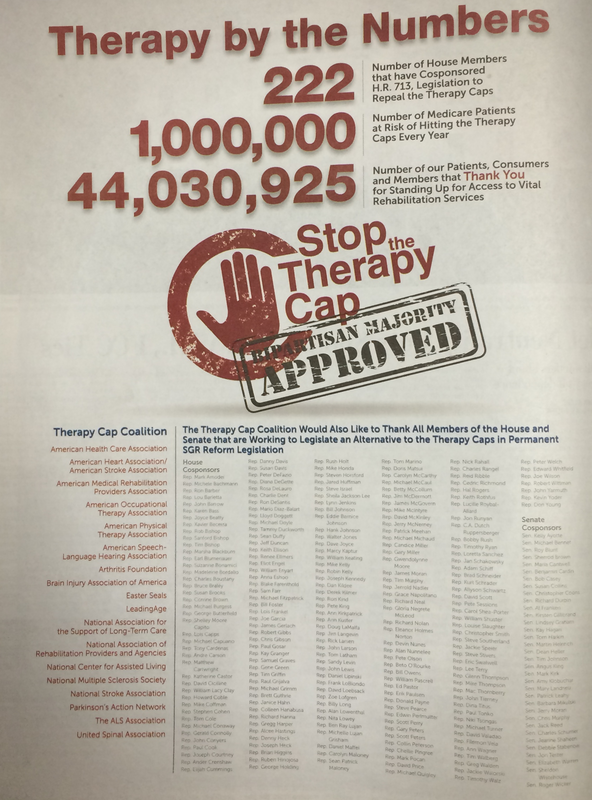 Spreading awareness of the Therapy Cap is extremely important because many deserving patients are being denied services that are integral to their recovery and most importantly, limiting their ability to remain independent in their local community. These factors, among others, is why the Medicare Access to Rehabilitation Services Act is so important. This piece of legislation would permanently repeal the cap on outpatient rehabilitation services, allowing us and other rehabilitative providers to take care of our patients according to their needs. 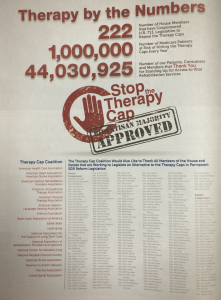 Therapy Center wants to thank the Therapy Cap Coalition for it’s continued support of HR 713/S 367. With therapy providers throughout the country coming together to make our voice heard in Congress, we feel we can actually make a difference for the betterment of our local communities. We believe now is the time to repeal the Therapy Cap permanently and to implement the reform provisions already negotiated by the House and Senate committees of jurisdiction. “Completing this legislation this year or before the March 31, 2015 deadline provides an opportunity to end the pattern of yearly extensions that puts access to medically necessary therapy for 1 million Medicare beneficiaries at risk,” says the Therapy Cap Coalition in a letter to the Senate Finance Committee.